This Captain America shield logo top was available at Target a few months ago. It was only thanks to Lindz that I was able to get it. I never saw it in stores, but she found it on their online site. I love this top because it’s what I like to consider an in-your-face-subtle-geek shirt. 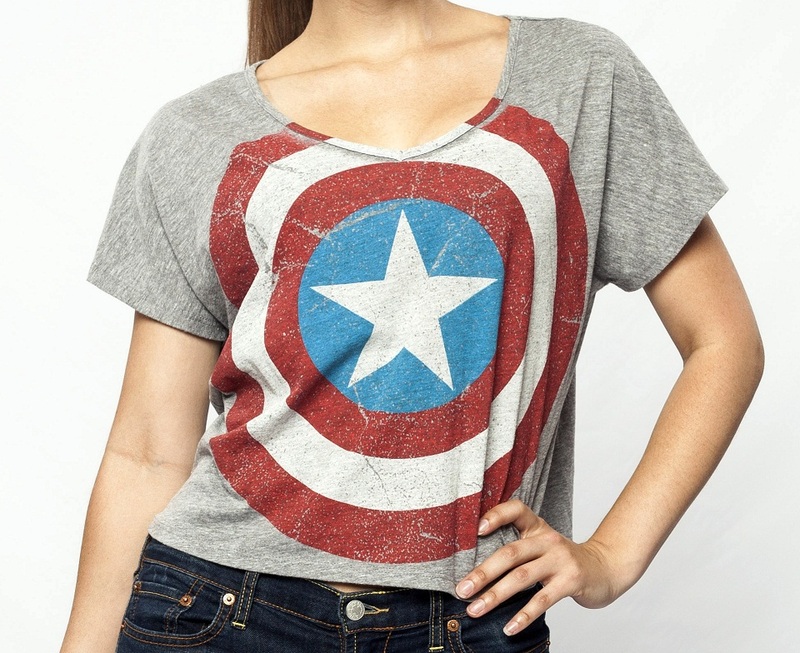 Any geek immediately recognizes this as a Captain America top, but anyone else just sees it as a normal top with some random logo or design on it. Companies like Junk Food Clothing and Forever 21 are great places to find styles like this shirt. Since this is a Captain America inspired ensemble, good ol’ American blue jeans are a must! I’m a big fan of Lucky Brand Jeans. This Michael Kors jacket is one of the best things I own. It’s stylish, comfortable, and has a great Rocketeer or Captain America look to it. A brand like Michael Kors can be expensive, and you can find plenty of great jackets at places like Target that will fit your budget better…but sometimes jackets like this can be worth the higher price tag. I’ve gotten an endless amount of compliments for this jacket, and it’s just a great, and very versatile, piece of clothing. I tend to stick with closed toed pumps and boots, but sometimes it’s nice to go with a pair of open-toed shoes. These brown heeled sandals pair well with a casual or dressy outfit, and the shade of brown happened to go great with my jacket. I picked up these heels from DSW a few years back. At a great discount of course! This outfit started with the accessories. 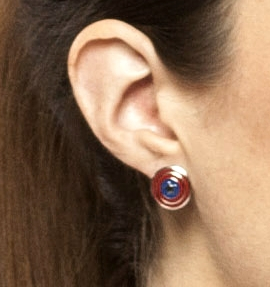 I first discovered JewelM – 1928’s Marvel jewelry line – when I saw Captain America at the El Capitan, as they had the jewelry for sale there. I immediately bought the shield earrings and bangle bracelet and couldn’t wait to pull together a complete outfit. JewelM is great because, not only do they come out with great styles, but they keep their jewelry at very affordable prices! Generally between the $20-40 range. JewelM continues to release new pieces, so make sure to check their site often! Or keep up with our blog, as we’ll always update when new things come out. Don’t forget, we’re always on the look out for geeky styles, so if you’ve got a look you’d like to show off, please share it with us on our Facebook Page! Thanks for mentioning the Millennium Falcon. I may be at Target tomorrow anyway. so I’ll look in store.